Allegations about President Trump’s interactions with the former head of the FBI raised concerns that tax reform, deregulation, and healthcare reform may be delayed. Markets pared back some of the losses on sound economic data and robust earnings. In the most recent week, labor market slack shrunk further as initial jobless claims fell by 4,000 hitting a 28-year low. In addition, the Philadelphia Fed manufacturing index vaulted from a reading of 22 in April to 38.8 in May compared to forecast of 19.5. Brazilian stocks plummeted 8.8% amid corruption charges against its president, Michel Temer. In China, industrial production increased 6.5% versus economist expectation of 7.1% suggesting the government’s anti-leverage campaign may be slowing growth. On the brighter side, Eurozone GDP released at +0.5% for Q1 and UK retail sales smashed all expectations with a 2.3% increase last month. US industrial activity recorded its biggest increase in more than three years in April, lending credibility to the US economic expansion continuing. Reporting the fifth straight quarter of expansion, Japanese GDP grew an annualized 2.2% in the January-March quarter. While this is the longest expansion streak in the postwar era, inflation continues to be stubbornly low. There has been little or no wage gains and private consumption remains fragile. Brazil’s President Michel Temer is under judicial inquiry on charges of paying hush money to a former coalition ally. If he is found guilty, he could be impeached. The Brazilian stock market plunged by 8.8% on the news and the real fell 8.5%. UK retail sales growth in April beat consensus with a 2.3% rise compared to 1% expected rise. The Office for National Statistics (ONS) said sales were higher mainly due to good weather. On a rolling three-month basis, sales rose 0.3% which is more in line with the economic conditions. Average UK prices slowed slightly in April, falling from 3.3% in March to 3.1%. Does It Matter How Hard You Hit a Baseball? Baseball is the best sport for statisticians. Play occurs one pitch at a time and its long history lends itself to deep analysis. The chart below provides another example where innovation and measuring capacity have created a superior understanding of how hitting the ball hard creates opportunities. The horizontal axis shows how hard a ball was hit and the vertical axis the average effectiveness. 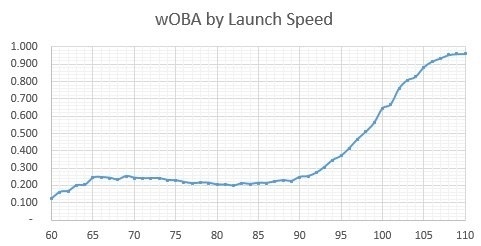 What is interesting is that hitting the ball harder doesn’t make much of a difference between 65 and 90 mph. But hit a ball 95 mph and the odds of reaching base are significantly higher. That trend holds up to just short of 110 mph and then levels off. It is a good reminder that not everything in life is linear. Bovespa Stock Index: BOlsa de Valores do Estado de São PAulo) an index of about 50 stocks that are traded on the São Paulo Stock, Mercantile & Futures Exchange. The Bovespa Index is the main indicator of the Brazilian stock market's average performance.